Welcome Sasha, CAAAV’s New Executive Director! You are here: Home » featured » Welcome Sasha, CAAAV’s New Executive Director! We write with exciting news! Following an extensive nationwide search, we are thrilled to announce that Sasha Wijeyeratne will be the new Executive Director of CAAAV: Organizing Asian Communities. A talented organizer, strategist and thinker, Sasha comes to CAAAV from the National Queer Asian & Pacific Islander Alliance (NQAPIA), where they served as Organizing Director. At NQAPIA, Sasha has cultivated local grassroots leadership in queer and trans Asian and Pacific Islander communities across the country, led national queer and trans Asian and Pacific Islander convergences with hundreds of participants and helped fundraise and create the infrastructure needed to sustain an indispensable organization in our movements. Additionally, they are a cadre member of Left Roots and previously helped lead the local work of #Asians4BlackLives in Madison, WI, partnering with Freedom Inc., Young, Gifted and Black to successfully propose redirecting funds set aside to build a new jail towards local communities. We couldn’t be more excited to be welcoming a new leader who will bring such tremendous experience and heart to CAAAV. Appointing Sasha as our new Executive Director follows an extensive national search. We are deeply grateful to Zahida Pirani, our transition consultant, who helped lead a complex process that engaged key tenant leaders in Chinatown and Queensbridge, youth leaders, staff and the board; conducting candidate interviews in English, Mandarin, and Bengali; and extensive conversations with a wide range of other CAAAV stakeholders. 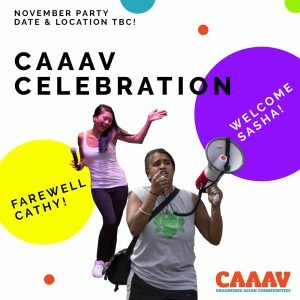 We are also indebted to Cathy Dang, CAAAV’s current Executive Director, who has been visionary steward of CAAAV’s legacy for the past five years. During her tenure, Cathy has significantly expanded our staff, membership base, programs and budget while exhibiting incredible leadership, courage and grace that have inspired us all. Finally, we are grateful for you and all of CAAAV’s supporters for helping us build an organization over the past three decades that moves working-class Asian immigrants and youth to fight for housing justice and a more just New York City for all of us. Sasha’s first day as Executive Director will be on October 17, 2018 and we hope you will join us in welcoming them and celebrating this next step in CAAAV’s organizational journey. 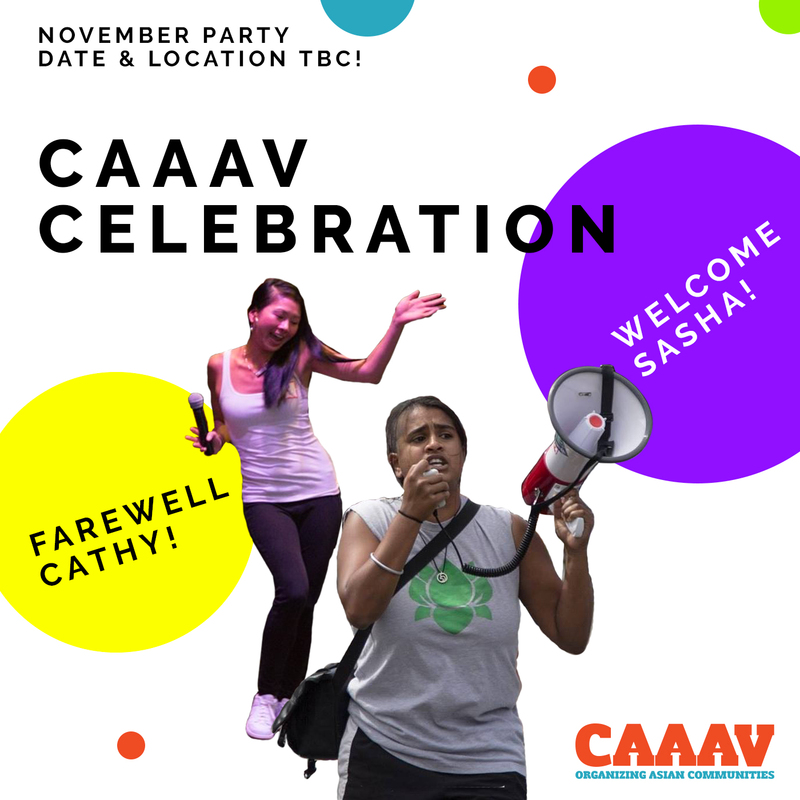 In November, we will be hosting a party to celebrate Cathy and Sasha. We hope you will join us, and you can sign up here to be notified when an exact date is set.